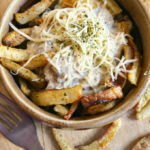 Crispy French Fries with Mushroom Gravy is filling, quick and delicious! It's an amazing meal, full of flavors, texture and melted cheese! I can clearly see why Poutine is one of the favorite Canadian dishes! Since I don't want to insult any Canadian by calling my recipe Poutine, I simply call it French Fries with Mushroom Gravy! Heat a pan and melt the butter. Add the onion and the spices to the butter and sauté it. When the mushrooms start to shrink a little, add the flour. Mix the flour very well with the mushrooms and onion. Pour the vegetable stock and the cooking cream on them as soon as mixed the flour. Cook it for 10-15 minutes, depends on how you like your mushrooms. If you like it firmer, cook it for 10 minutes, if you like it softened and completely cooked, cook it for 15-20 minutes. Serve it with the French Fries with cheese.